UVA and UVB rays are levels of ultraviolet light that come from the sun, and are known to penetrate layers of your skin and have the ability to cause damage. From superficial burns up to skin cancer, there are so many reasons to protect you from these potentially harmful rays. If you think you already are fully protected because you apply sunscreen, think again. Knowing the difference between UVA and UVB light will give you insight on what each type of ultraviolet light is can be responsible for and can even help you select the sunscreen best for you. UVA rays are always present, whatever the season or the weather may be. If you think that you cannot get sun damage when it is cloudy outside, tell that to the UVA rays. These rays are so powerful that they also penetrate some clothing and even glass. Also, UVA rays are the rays responsible for the signs of early aging as they are able to penetrate much deeper into the skins lower dermis and subcutaneous layers of skin, potentially damaging these vital cells. In terms of the sun’s rays, UVA rays used to be considered relatively safe, which is why tanning beds, which use UVA rays, took center stage. Recent studies have shown, though, that using tanning beds before the age of 30 increases your skin cancer risk by 75%. People might think that their skin looks younger because it is tan, but each tan may be causing your skin irreversible damage, which will be more apparent later in life. When you think of UVA rays, think sun spots, wrinkles and leathery skin. UVB rays are the rays that you blame when you get a sunburn from swimming in the beach or pool. Unlike UVA rays, these rays vary in intensity depending upon the time of year and atmospheric obstacles; they are strongest during the summer months. Still, do not discount the fact that they can reflect off water or snow, so it is always important that you protect yourself throughout the year. Also, UVB rays are the culprit for causing most skin cancers. While the large doses of UVA rays can lead to the development of cancer, it is the UVB rays that are usually to blame. Heading the advice to stay out the sun during the midday hours is wise and it is the UVB rays that you are trying to avoid most during this period. When you think of UVB rays, think of sunburn and skin melanomas. All sunscreens offer protection against UVB rays, but it was not until recent years that sunscreens started to include UVA protection. However, as of 2014, not all sunscreens do. In this case, look for one that specifically says UVA/UVB protection or one that says “broad spectrum coverage” on the bottle. 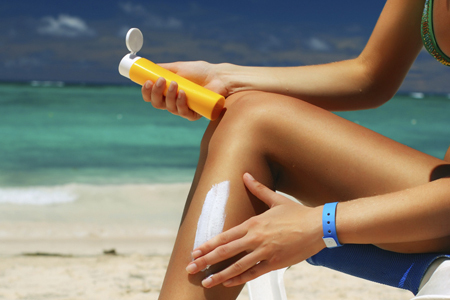 Broad spectrum sunscreen offers skin damage as well as skin cancer prevention. Use a minimum of SPF30 and reapply every two for prolonged exposure to the sunlight. The best sunscreen SPF level is a controversy depending upon who you ask. To determine how long your sunscreen will last under perfect conditions (this means no water or sweat taken into account, carefully read the packaging since the ingredients may vary for each product. Do not forget that sunscreen does not last forever. All ingredients have a half-life and recommend you pay attention to the expiration dates. You should use about a full ounce on your body and about a teaspoon on your face every time you apply. Never let a cloudy day affect your decision to protect your skin from the damaging rays of the sun. The less protection on your skin, the more prone you are to sunburn, cancer and aging signs.